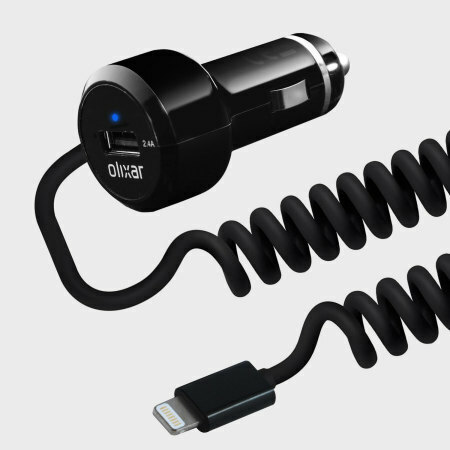 Keep your Lightning devices fully charged on the road with this high power 4.8A total output Lightning car charger with extendable spiral cord design from Olixar. Plus, charge an additional USB device from the built-in USB port! There are more reviews in other languages. Show all languages to see more reviews and we can translate them for you. Ordered and received it promptly. It was as advertised, and could not be more pleased with my purchase. I ordered this as a gift for my daughter. She often travels long distance and uses her phone as a satnav which uses up the battery. She leaves this little device in her car now and she doesn't have to worry about losing power when she most needs it! I'm very pleased with this car phone charger - it charges much faster than my previous one and the extendable spiral cable makes it a very neat piece of kit. Great value for money, compact and good build quality. When it charges it is super fast one the fastest I've experienced, though it doesn't always connect well enough to start charging. But huge thumbs up to mobile fun team for helping to change the charger when I told them the first doesn't work properly. It was excellent seamless communication with immediate replacement. One the best services I've encountered! Never used a charger in a car before and this was faster than charging my phone at home. Well worth buying. Neat charger enables me to charge my iPhone in the car whilst also charging my sat nav or my wife's Samsung. Easy to tuck away in the glove box or the centre console. Has a blue light glowing when plugged in so easy to see the dark. Just what I needed as I am large email and calling user on my mobile. The reason for this purchase is the previous one failed. I hope this one lasts longer. Having looked at items for sale there is no real alternative. So I have bought another one. This charger does what it says on the tin. It has quite a low profile which allows it to fit well under the folding lid of the armrest in which sits one of the USB ports on my car. The coiled connection lead is tidy and not too tightly coiled so there is no significant strain on the phone connection even when the phone is located away from the USB port. It’s charge is speedy which is very useful. I don’t know if it’s me but I can’t get the curly cable to stay unravelled to stop my phone being pulled out of its holder whilst charging. Apart from that the buy one get one free was a welcome bonus! Thank you for your innovative ideas. Not long since I bought one and so pleased a friend needed one so got it and remarks made to me very happy. Does what it claim. Best device found. .Supplies the full current claimed for apple devices. Does not overheat at full load. Variation with mini USB just as good. Now have three. Very happy purchase and helps immensely. Plugs into car power unit enabling 2 devices to be charged. Grandchildren play on their IPads in the back of the car without fear of battery dying. This product is amazing, works very well, really glad that I bought it been thinking about buying it for some time and finally bought it. This works and does the job the but the end bit into the phone is always hot when when plugged in the phone or not. Also it's lose so it looks like it's bending in the phone or the outside. Very useful item. The integrated lightning cable makes car charging iPhones convenient, and, being coiled, is tidy when not in use. Neat & compact, coiled cable makes for easy storage too. Bought this charger, just in case and had to use it sooner than I thought as I forgot my charger for a night away. Was really quick and is so handy with an additional Usb port, which I haven't used yet. The curly wire is very tight, perhaps because it is new and had to really pull it to reach me. Having said that it was very neat and not trailing everywhere. All in all a good purchase. Happy with my purchase, money well spent. Nothing more really I think the product is as described on the advert . Always the first place to look when you need a mobile solution. Needed an apple charger for the car but also a mini usb for andriod devices. Best of both worlds found on Mobilefun website and as a special offer! Long days mean I'm always running out of battery but no time to wait to re-charge. This Olixar charger is super quick and even on the shortest of car journeys puts enough life back in your batteries to keep you connected. and it will charge my tablet at the same time as it has a usb slot as well. Happy customer thanks again to Mobilefun! This product is really good. If you are on the go and you forget to charge you phone then with this very good phone charger can get you fully charged to keep getting on with your day and never get caught out.So go on and get this phone charger. I like being able to see the short videos of the items on Mobilefun as it helps to decide which I choose. Always get good service with a fast delivery. Item us just as described & exactly what I needed at a good price. Charges my iPhone to full on a 1 hour journey. Exactly what I wanted. Seems to work ok but sometimes causes interference on the radio. I think that is more lieky to be a wiring issue within the car though. Charger is exactly what I need very useful thanks. This charger does NOT work with my I Phone 6s plus. The charger works well and charges quickly but the light showing it is powered up could be a bit more visable. Interferes with my car radio when in use. This piece is very useful as you have two core one for Iphone and USE which you can use for any smart gadget to charge, So you have options which is really great I charge my E-cig and Blackberry or Samsung phone. Works perfectly fine. Excellent service get delivered in couple of day with free delivery options. I had no idea about this product until by chance I found the website. Totally brilliant service. Excellent information about the product. Just what I needed as I often forget to charge my phone before leaving the house. Impressive postal charge choices. Arrived on the day they said it would. Excellent. Wouldn't hesitate to use again or to recommend to friends! Thanks! I actually bought two of these for two different cars - the cars have slightly different styles of 12V outlets and this charger fitted perfectly in both cars. When plugged into the 12V socket, you get a discreet visual indication of power via an illuminated sign on the face of the charger. The coiled power lead that terminates in a lightning connector is long enough to reach the dashboard, even from the centre console. The charger also has a USB socket so you can charge a second device at the same time as your iPhone. Overall, this is a nice, stylish charger that offers additional useful functions over and above charging your iPhone. It is discreet and looks like a quality product. So good I bought another! Firstly I was impressed by the fast and efficient delivery. Then sadly the device would not charge my iPhone from the attached lead. It did work from the other port though. I emailed for advice from mobile fun and had an immediate reply that they would send out a replacement. This arrived really quickly and works very efficiently. Compact and ideal for in car charging, reliable piece of kit. I use for my Iphone5s thus far no complaints. Charges as quick as a home charger. This charger is one of the best and fastest I have bought for my I Phone 5s. The only reason I gave 4 stars instead of 5 is the length of the cable, which, because it is coiled, means there is quite a tension on it when extended. Consequently I have bought a longer one which plugs into the USB port, for use on a boat. Otherwise it is fine - easy to fit in and remove from the charger socket. Order arrived yesterday and seems to be working perfectly. I have purchased a few chargers over the last couple of years and they were not as good as the Olixar, this is a rapid charger and always works when you plug it in, an added benefit is the USB charger. Delivery was quick and well packaged. The first one developed a fault with the lightning cable end although I was able to continue to use it with the USB port and another cable. I contacted Mobile Fun, and they immediately referred me to their returns page where I printed off the label, wrapped up the faulty charger, and posted it at my local store. Not many days later I received a brand new one. Many thanks Mobile Fun. Works so well I bought two. Bought one of these for my daughters' Iphone 6 - works well and no compatibility problems so bought one for my Iphone 5 as well. Good quality and fit and fast charge. The coiled wire keeps everything compact and tidy. Good service with prompt delivery - couldn't fault the process or product. I do a lot of travelling with work and having my phone charged is essential. It's sleek, effective and I can charge my portable Linearflux card or have my sat nav plugged in the USB port at the same time. Genius. Just what I was looking for for my car, great little item and a super price. Fits securely into the cigarette lighter, I haven't found any need to jiggle it to get it to work as I have with others of these I have tried. This must be the fastest supply of a product I have purchased and when it arrived it did the job without any fuss or bother and it continues to perform really well.. I will not hesitate to order other items from Mobilefun in the future. The cable doesn't work with iPhone 5s. Can you please contact us as this is compatible with the iPhone 5S. Was really pleased with this for about 2 days, then iphone 6 kept saying item not supported and not charging. The next day it worked the next day it didn't, therefore can't rely on it & will be looking for another charger from somewhere else. Sorry to hear you are having problems. You may have a faulty item, however please ensure you are running the latest version of iOS just to be sure. Please contact us if you continue to have problems. This item may be advertised as being compatible with Apple but I suffer from the dreaded message of "this item is not compatible" etc... and unless you OK this message, the phone refuses to charge using it. I do not call this compatible - I expected it to work seamlessly. Sounds like you have a faulty item, please contact us. Also ensure you aren't charging anything in the built-in USB port and see if you receive the message? A useful tool when using your iPad as a SatNav! I've found that if you're off on a journey that needs traffic guidance, using your iPad in your car, without a charger will get you no more than an hour form your home. Luckily, this little device helps get around the problem, keeping your iPad charged as you navigate and allow me to keep my HTC on charge at the same time (if not my son or daughter's Hudl) It's well made, well worth the money and get's my thumbs up! I have an older car without a USB connection and wanted a charger that sits in cigarette lighter neatly without a USB and wire sticking out the top whuch would catch on my arm. This device fits the bill very well and I have an opportunity to charge a second phone when required. Good design for my needs. Oh, by the way, it also charges good too! Great charger. Fast charging compared to normal supplied charger in my car. Good to have extra usb port. Only small niggle is it can cause a little interference on my radio? Not a problem to me though just pop on a cd! Usual 100% fantastic service from Mobilefun! Hi purchased Olixar USB fast charger for my car, very well made like the idea you can use to charge too things at a time. Should last for years very pleased with my purchase. So far so good. This product looks well made and strong. It has a good length of lead on it and is neatly designed. Well lit symbol on it to show it is charging. A really good idea to have the other sub port aswell for charging other items at the same time. A neat product which does the job for a reasonable price. Not a bad charger, but the main problem I have is that there is not adequate RF isolation. Plugging this in and charging my device causes radio reception issues. Not an issue I have see with many of other car chargers I have had. Love this charger. Looks good, does exactly what it should. Customer service also 10 out of 10. Highly recommend! The item was delivered very quickly and it works well charging my iphone in the car. They always say "you get what you pay for" but for once I paid relatively little for a quality item. It's nice to get something for once without feeling ripped off. Well done you. well conceived ,practical essential item. I ordered an in car charger for my iphone and ended up with an android charger, but within a few days I had gone through the returns procedure and had the correct charger within a few days. No hassle and very happy with the equipment and efficiency of the company. Great product. Neat and well designed. Does exactly as it said on the tin! An excellent car charger for fast charging of Ipad/ IPhone with extra USB port for other devices. It is always in my car as I use Co Pilot on my IPad for a Sat Nav and it needs to be on a charger for long journeys and this fits the bill perfectly. Sorry, no matching reviews have been found. Please check the filters you have applied. Please check the filters you have applied or you can Show all languages to see reviews and we can translate them for you. Sign up for great offers!